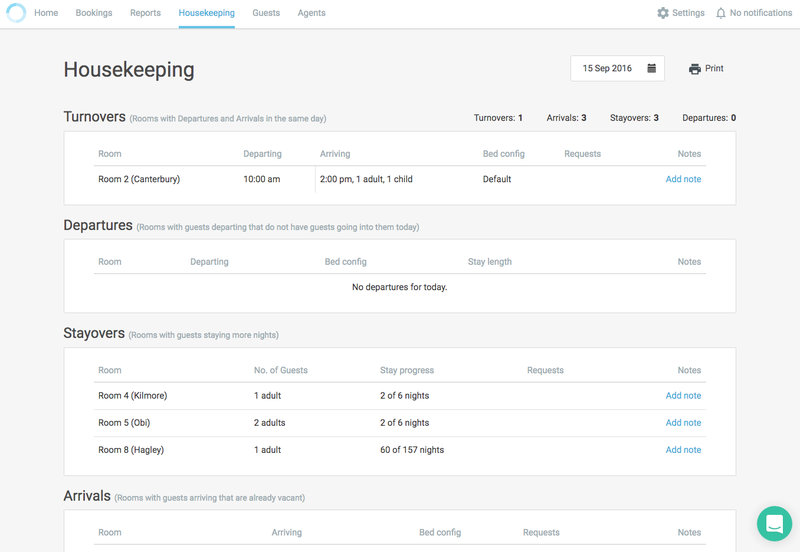 The Housekeeping reports allow you to view the list of rooms that require housekeeping services. The rooms in the Housekeeping report are listed in order of priority for cleaning. Turnovers - these are rooms where someone is departing and a new person is arriving in the same day. Departures - these are rooms where people are leaving today. If someone else is arriving in that room today too, then they'll appear in Turnovers. Stayovers - you'll see what rooms, with how many guests, and where they are in their stay. This is great for keeping up with housekeeping procedures, like changing sheets every 3 days. Arrivals - because these rooms were empty before the guest is due to arrive, you just need to give them a quick spruce up to make sure the rooms are ready for these people. This report is printer friendly - it's formatted with all of your notes, bed configurations, and guest requests. Click the print icon on the top right of the screen, and then send off as many copies as you need. To view the housekeeping report for a past/future date, click on the date selector and select the date you would like to display. Head here to view how to set up extras and bed configurations to show in the Housekeeping report.